Exclusive for Cassette Store Day 2015. The Gift, Vol. 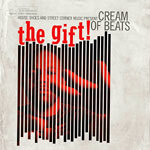 6, is Cream Of Beats' first celebration of the blues heritage for the Street Corner Music label. Cream Of Beats plays a very basic style of jazz, a genre that has gone largely untouched by post-Bop advances (at least not by many beyond those of Horace Silver and the early Sonny Rollins) and which is informed almost exclusively technically and inspirationally by the essential sources: gospel and the blues. The scope and breadth of its expression is restricted pretty much to the experiences and emotions which these sources are about. On this basis, and by the standards of 2015, it is probably valid to call Cream Of Beats' blaps ''primitive''. But this is not meant to imply a derogation of either the music or the man who is making it, rather it is intended to define both in their relationship to other contemporary jazz forms and contemporary beat culture artists. ''Alive'' is a word that could be accurately applied to the whole album; the conditions out of which these musicians have come are hardly conducive to anything but the opposite of that word, but Cream Of Beats and the others have discovered in their music where the life is.